The first time Buddhism introduced was around the 8th century from the kingdom of Nam-Chao (which is China nowadays). The Buddhism practices at that time were Mahayana Buddhism, popular Buddhism practice in China, but it does not have strong impacts on the country. And then, in the 14th century, an important event happened. It was when Fa Ngum unified Laos and became the king of Laos monarchy, the main religion of the whole country has changed. Fa Ngum was descendent of the royal family and had followed his father to Cambodia for years. During his childhood, Fa Ngum was taken care of a Cambodia Monk. He married a princess who was a devout Buddhist. Later on, with the support of Cambodian King, he has successfully unified Laos and implied Theravada Buddhism as the main religion for Laotian. 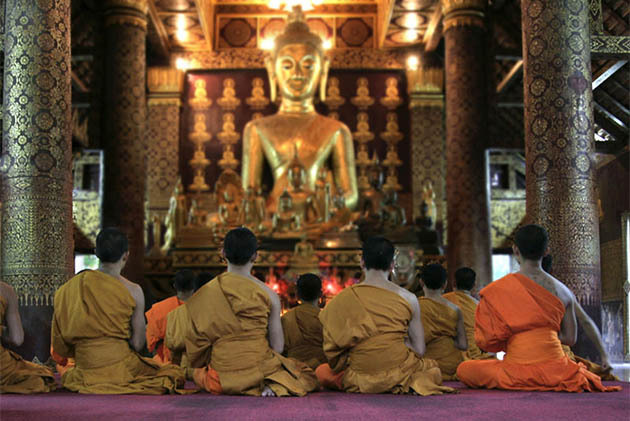 In this part, we will go deeper into the concept or idea of the Laotian main religion – Theravada Buddhism. It is based on 3 concepts and contains The Four Notable Truth taught by Buddha. 3 concepts introduced in Buddhism are Dharma, Karma, and Sangha. Dharma is referred to as a guide to right action and belief, the doctrine of the Buddha. And in contradiction, Karma is the retribution which people will have to suffer if they do bad things, people are responsible for everything they do in their life, nothing is considered as unfair here. And finally, Sangha is the suggestion of how they can improve the sum of Dharma and Karma, in a different explanation, Dharma is positive and Karma is negative, Sang Ha shows you how to make the sum less negative as possible and move toward the positive side. Four Noble Truths based on the experience of Buddha has been created. Four Noble Truth is the existence of suffering, suffering has a cause, these sufferings can be stopped and how to eliminate these sufferings through Eightfold Path. Under influences of Buddhism, every village in Laos must have one temple of its own, or in Laotian called “Wat”. For instance, Luang Prabang which has been chosen to be the capital of Laos during Fa Ngum’s monarchy can clearly show all the impacts of Buddhism on Laos’ culture. 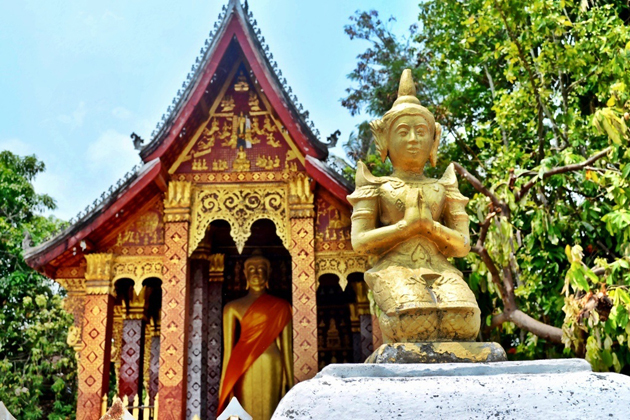 In term of its names, “Luang Prabang” in Laotian means Royal Buddha Image. 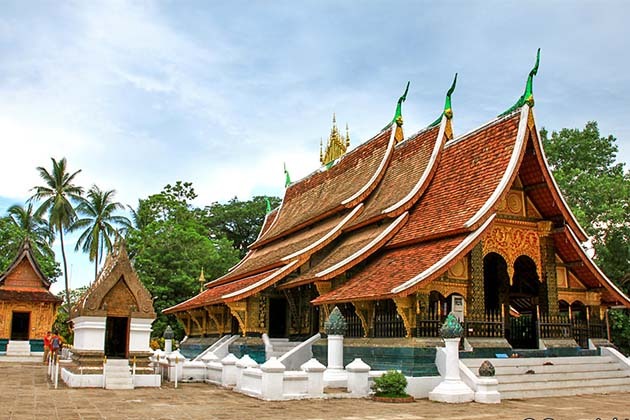 Moreover, once you have arrived in Luang Prabang, the destinations which are must-to-see are temples. The locals are so familiar with Wat Xieng Thong, Wat Manorom, Wat Khili, Wat Mai, Wat Wisunalat, Wat Long Khoun, etc. The main characteristic of the “Wat” is the special roof structure sweeping to the ground. And there are also paintings and carvings on the wall demonstrating all events in Buddha’ life. Let alone in Luang Prabang, there are over 15 temples existing and in total, in all over Laos, there are already 5000 temples, this huge number is enough to tell everything. The Buddhism impact is so big that it has formed a tradition in Laos that every man is expected to become a monk and live in the pagoda for a certain period of time in his life. If a family has one man has done that custom, the family will be very proud of him and gain merits from society. For the other that can’t carry out this practice, they can also make some donations or worshipping or offering food for Laotian monks. Beside “Wat” (Temple), “That” (Stupa) is also a typical thing in Laos and is often found in Vientiane, near the border with Cambodia because the big influence of Buddhism has been originated from Cambodia in the past. That Luang and That Dam are two outstanding stupas with the four corned shape which resembles a lotus. Lotus in Buddhism represents for the innocence, an important feature in Buddhist idea. 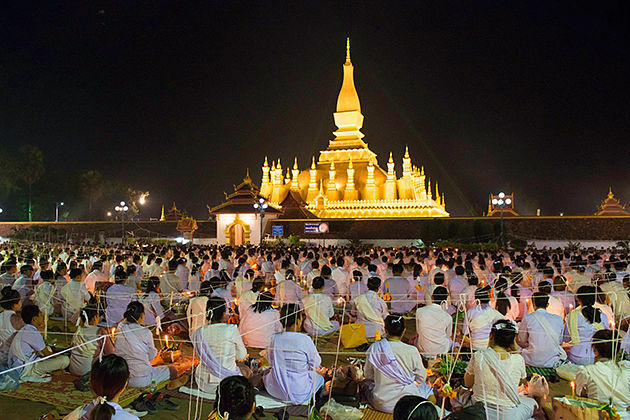 Many ceremonies and festivals are held in That Luang, which shows its importance in spiritual belief. Unlike Western Style, when a person passes away, the funeral ceremony doesn’t happen in a church. In Buddhism perspective, the death of a person involves some ritual ceremony carried by monks who are invited from temples. 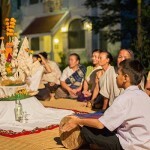 It is one of the traditional customs for Laotian Monks on the first day after the full moon of the eighth lunar month, marking the beginning of three months of raining season in these three months, all the monks have sleep at their own “wat” at night and are not allowed to leave them in three months. The day to commentate the birthday, enlightenment, death of Buddha is held in May.